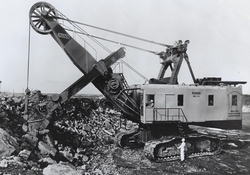 Our newest DVD, compiled from 11 original 16mm films in the HCEA Archives, features shovels and cranes of Marion and its associated companies: Osgood Company, which Marion acquired in 1955 along with Osgood subsidiary Osgood-General (the former General Excavator Company), and Quick-Way, which Marion acquired in 1964. Color films show Western Contracting�s giant 191-M shovels; 43-M and other log loaders; the 80-M shovel; loading shovels; and The Osgood product line. B&W films cover the Marion Type 7 Shovel; Marions at work at Boulder Dam in B&W; the Quickway J and E; General 310; Osgood 1� Yard; and the Osgood-General line. Sound included on some. Approximately 110 minutes playing time.